Product prices and availability are accurate as of 2019-04-12 11:06:53 EDT and are subject to change. Any price and availability information displayed on http://www.amazon.com/ at the time of purchase will apply to the purchase of this product. Ideal for entertaining or family parties, the De'Longhi Combination Drip Coffee, Pump Espresso, Cappuccino and Latte Machine delivers delicious coffee beveages with ease. Perfect for the morning or after a meal, the three-in-one machine prepares delectable cappuccinos and lattes with the easy-to-use patented Cappuccino System frother. 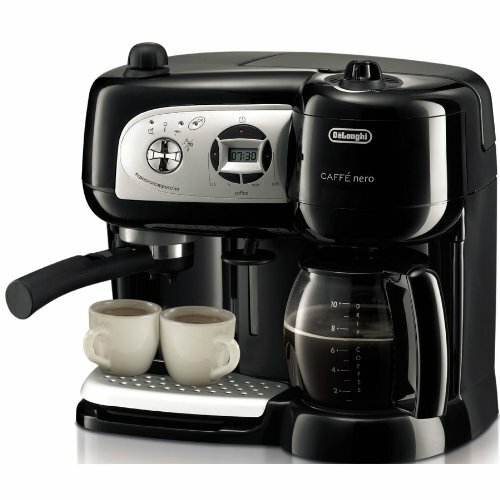 For those who prefer a more full bodied brew, the machine features the patented Flavor Savor brewing system. This special function fully saturates and steeps coffee for a full, robust taste. For coffee just the way you like it, use the Accuflavor selector dial to choose your ideal coffee strength. Other highlights include 24-hour timer, non-stick warming plate, removable water tank and removable drip tray. Dimensions: 17.1? x 16? x 12.3?. 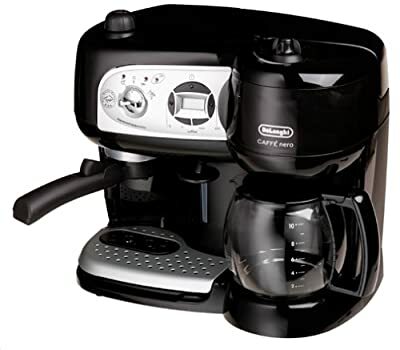 Make drip coffee, espresso, cappuccino and latte with this three-in-one machine. Saves counter space instead of having a separate drip coffee maker and espresso machine. Wake up to the aroma of fresh-brewed coffee with the 24-hour programmable digital timer. Easily prepares latte and cappuccino with the patented instant froth dispenser; lets you add frothed milk to the same cup as your coffee for a cappuccino Durable and long lasting permanent gold-tone filter is specially designed to keep even the finest grounds out of coffee. Choose the strength of coffee just the way you like it with the Accuflavor selector dial.